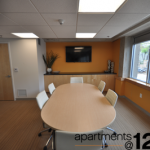 Round the Clock Lobby Staff and On-Site Management – At The Apartments @ 1220 North Broad our on-site dedicated service professionals are available to address all of your service needs. Our lobby attendants are present 24 hours a day, 7 days a week, 365 days a year. 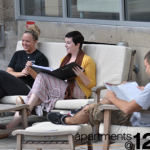 Our management team will reach out to welcome you to the building and help you settle in. 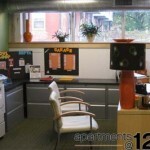 They are also available on an ongoing basis to address all of your requests and questions regarding your experience in the building. 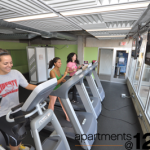 State of the Art Fitness Center – A state-of-the art health and fitness center features cardio, strength equipment and tanning facilities with ample natural light streaming through a wall of windows. 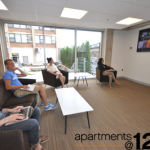 Media Lounge – Relax and enjoy a massive lounge featuring ample natural light, large screen TV’s, open kitchen and sofas, tables and chairs for dining, conversation and gaming. 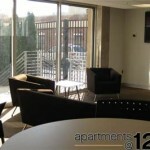 Study/ Work Areas – Residents have round the clock access to multiple private study areas with free wireless and/or Ethernet connectivity options. Landscaped Terrace – This beautifully landscaped terrace is complete with lounge chairs, eating tables and park benches and provides the perfect setting to relax, refresh and recharge or work wirelessly while enjoying the serenity of lush greenery. Main Courtyard – A proposed 20,000 square foot area featuring basketball courts, shuffleboard, seating areas and green spaces designed to enjoy a beautiful day socializing, playing and seclusion from the busy city atmosphere. 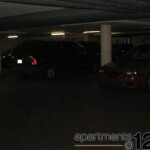 Parking – A limited amount of covered parking available for an additional monthly fee. 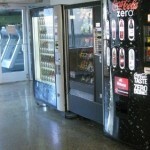 Vending– ATM machine, beverage machines, and snack machine. 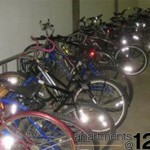 Bike Storage – Dedicated indoor bicycle storage room is available with card access entry. 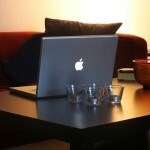 Wireless Internet Connection – Free wireless Internet connection available in common areas. 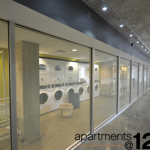 Laundry Facilities – Conveniently located on the main floor adjacent to the lounge area, Apartments@1220 offers numerous front loading washers and driers for your convenience at a minimal fee. Computer Lab – Take advantage of our multiple platform computer hardware including Apple and PC or utilize your laptop with our free wireless Internet or Ethernet connection in our 24 hour a day, 7 day a week computer lab. Conference Room – Practice a presentation and utilize our 46″ monitor with media attachments in our state of the art conference facility with seating for up to ten people. Available to all residents, reservations recommended. Main Lounge Areas – Conveniently located on the first floor of the building are multiple lounge areas decorated in a modern style. 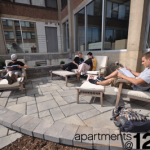 These lounge areas offer free cable tv, free wireless Internet connection, and are a great place to relax, study or simply socialize with other tenants. 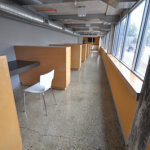 Leasing & Management Office – Located on the main floor is our leasing and management office which is staffed during regular business hours or by appointment. 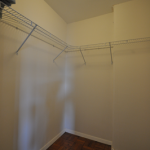 Spacious Closets – Each unit contains multiple large closets with closet systems for your storage needs. 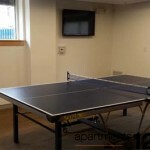 Ping Pong – Head over to our ping pong room and play some heads up or team table tennis. Join one of periodic tournaments to see who is the king of the building!